In a down year for Canadian sales of American muscle cars, November’s results seem at first glance to be a bright spot. On the other hand, sales of the Chevrolet Camaro continued their plunge and the Dodge Challenger was down 9%. The Ford Mustang’s 25-unit increase pushed sales of the muscle car trio forward, but to what extent? November’s 266 sales accounted for just 3% of the trio’s year-to-date sales. European roadsters and coupes – the Boxster, TT, Z4 class – have enjoyed a resurgence in 2013 thanks to the Jaguar F-Type and growth at Porsche. November sales jumped 39%, and even without the F-Type, sales would have been up 16%. However, none of the cars in that category sell as often as the more costly Porsche 911, nor do they sell in the kind of numbers supported by more mainstream luxury coupes like the Audi A5 or BMW 4-Series. In the 4er’s second month, BMW Canada sold 243 copies of the 3-Series-based two-door. That’s just one fewer sale than Ford collected with the Taurus; it’s two more than Infiniti managed with the new Q50 sedan. 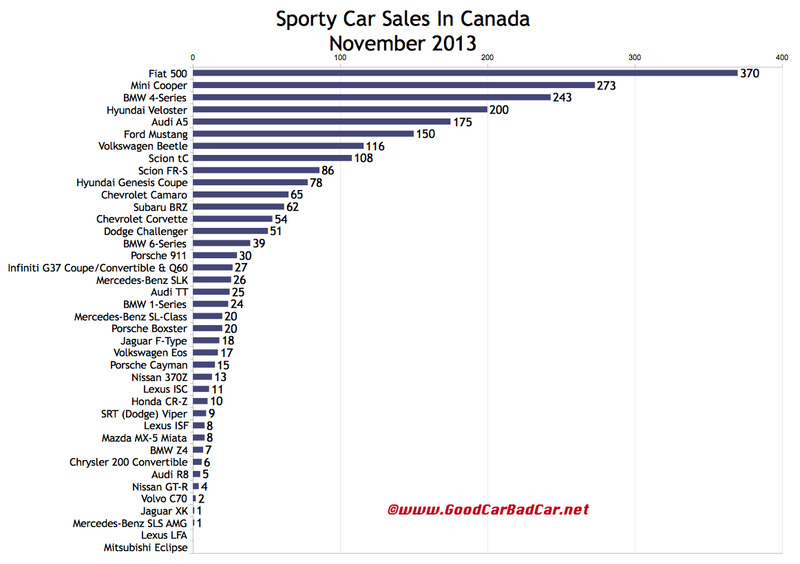 In fact, the 4-Series outsold two-thirds of the passenger car nameplates available in Canada last month. You can click any model name in the tables below to find historical monthly and yearly Canadian auto sales data. You can also select a make and model at GCBC’s Sales Stats page. These tables are now sortable, so you can rank sports cars, roadsters, coupes, and hot hatches any which way you like. Suggestions on how GCBC should break down segments can be passed on through the Contact page.